The Shiny Vampire Club: Happy Birthday Jes! YAY!!!!!!!! I love, love, love! thanks kari! 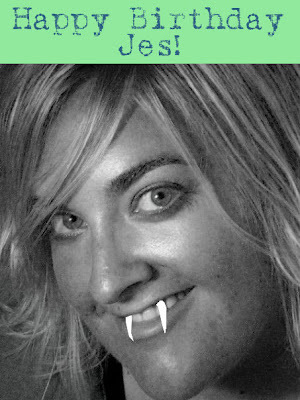 I was sad i didn't get the vamp treatment a few weeks back! yay! i hope u had FUN!!!! Speaking of cake (mmmm), are you making tortilla soup tonight, Jes? I want to hear how it goes! someone needs to bring me some cake. Hey, vampires don't have fangs, technically...why not just color her irises red? Happy Birthday! only sm's vamps don't have fangs. pretty much every other vampire does. Also, if Jes' eyes were red, she would just look gross. We here at the shiny vampire club consider fangs to be good clean fun and promote the mythical fangtastic vampire at all possible times. The picture of Jes is black and white... so her irises could be red. Still, she's not a newborn, and I would never offend a fellow vampire.